The move is seen as part of a ploy to form a coalition of two factions. 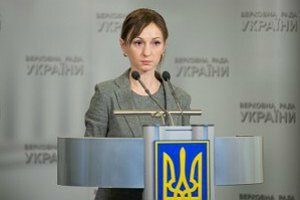 MP Iryna Suslova has joined the president's Petro Poroshenko Bloc faction in parliament, first deputy speaker Andriy Parubiy announced at the morning session on 30 March. Suslova was elected to parliament on the Self-Help party's list but was expelled by its faction after she voted in favour of appointing Viktor Shokin as prosecutor-general. She has been unaffiliated since February 2015. Oleksandr Bryhynets and Dmytro Bilotserkivets joined the Petro Poroshenko Bloc faction on 29 March. They were sworn in as MPs after MPs Yehor Firsov and Mykola Tomenko were unseated for leaving he faction. Currently, the propresidential faction includes 139 MPs. Earlier, one of the senior members of the prime minister's People's Front faction, Viktoriya Syumar, said that the Petro Poroshenko Bloc and the People's Front were trying to forge a coalition of two. In her words, this would require about 10 MPs to join either faction. On 29 March, the Petro Poroshenko Bloc, the People's Front and Fatherland failed to agree on forming a parliamentary coalition after Yuliya Tymoshenko's Fatherland put forward additional demands.